Dad rented a boat for us today to take out around the island and also to visit other islands in the area, of which there apparently are a TON… I had no idea. Anyway, it was kinda breezy/chilly this morning but by the time we got onto the boat it was sunny and getting warmer. We still brought sweatshirts because it gets cool at night and we weren’t sure what time we’d be getting back to the house. GOOD PLAN. Once we got out into the water past the no-wake zones, it was FREEZING!!! We were all sooooo cold. We brought towels with us, thinking that maybe we would get in the water if if got too warm or something CRAZY like that. Oh no, there was no getting in the water today. But we did put those towels to good use. Between the four of us kids (and I say “kids” only to designate the 20- and 30-somethings from our parents, the 50-somethings), but anyway… between the four of us kids, we had 7 towels wrapped around us protecting every inch of our skin from the cold wind. We started out on the front of the boat, sitting with the towels wrapped around us, then layed down on the front of the boat, and when Dad hit the gas at one point we all slid from the front of the boat down a step to the floor where we cuddled up and took refuge for the rest of the trip. We were laughing and crying and screaming and cracking jokes the whole way to the mainland. It took so much effort just to keep the towels from flying off of us and it was surprisingly exhausting! Just as we were hoping that our stop at the mainland was coming soon and Dad informed us that we still had another 30 minutes of chilling torture, Knate said “Do you guys realize that we just left a mansion with a hot tub and a cappuccino maker?!?!?!?!! !” Good times. Once we got to the mainland, we took the car into town to make a mid-week grocery stop. When we first arrived, the ferry driver who would take us to the island with all of our bags and groceries looked at us and said, “First time here?” We answered yes, and he replied, “I can tell. Second timers bring half as many clothes and twice as many groceries.” So we went back for seconds on the groceries. After our grocery stop, we piled it all back into the boat and assumed our positions on the floor of the boat covered in towels until we got to Cabbage Key. Cabbage Key is a small island near North Captiva that is owned by a single family and is home to a beautiful collection of cottages. Cabbage Key also boasts an amazing restaurant. Mom had heard that Jimmy Buffet wrote Cheeseburger in Paradise after a meal at the Cabbage Key, but upon further research I found out we were a few thousand miles off. Oh well. The story did get us to the restaurant in the first place and once we got there we were very happy to have made the stop. The front room is small and typical, the middle room is set up like a family’s living room with larger dining tables and a fireplace, and then the back room is decorated solely with dollar bills. Yeah. Dollar bills. Every surface of that room was COVERED floor to ceiling in bills, layered so thick on the posts in the center of the room that the posts got a few inches thicker in the middle than at the top and bottom. The doors, walls, ceiling, and rafters were all covered in dollar bills, and on each one was written the name or message of the person who left it. After unsuccessfully trying to estimate how much money was hanging by masking tape all around us, we asked one of the waiters. We were shocked when he told us that they estimated between $70,000 and $80,000. He said they lose about $10,000 per year because it falls off the walls or ceiling from old tape. It was well worth the Arctic-like conditions to see that place. We’re back at the house now, after a short trip to the pool to warm up in the sun. Mom and I made dinner (baked ziti!) only to realize that everyone else in the house was asleep. This is the vacation of naps, I suppose. Here’s a photo I took yesterday right outside our house. 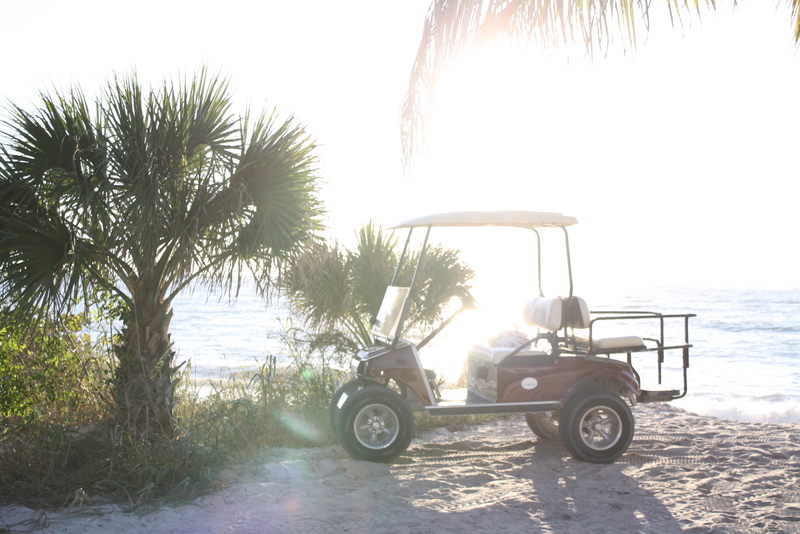 It pretty much sums up life on the island: palm trees and golf carts.